TGIFIFA – Thank Goodness It’s FIFA! At 5:30 a.m. today, the hottest place to be in Seattle wasn’t one’s favorite local coffee shop. Instead, crowds gathered in brewpubs all over the city to watch the 2010 FIFA World Cup. Yes, breakfast + beer + soccer! They came by car, bike, bus, and on foot. It is, after all, the largest sporting event in the world. Soccer fans in Seattle show their pride by waving Sounders FC scarves, marching, face painting, and chanting. We hear fans in other parts of the world can be a lot more passionate. 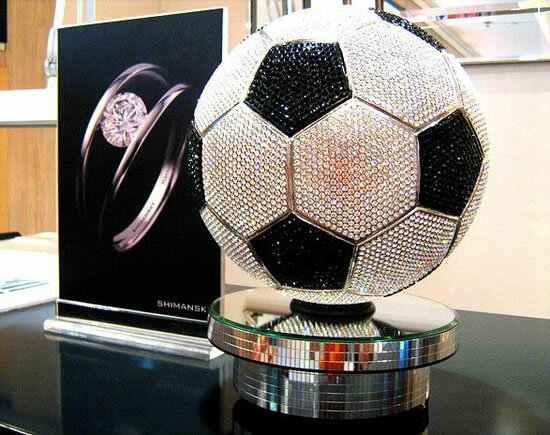 😉 For us, the question is: how would a jewelry designer convey his enthusiasm for soccer… err, football? And the winning answer turned out to be: with 3500 carats of diamonds! Remember the interchangeable bezels? They are back! But better than ever. The new Gucci “U-Play” collection offers two watches in one! Each watch comes with an interchangeable bracelet and bezel set. You can easily change the look of the watch by removing the bracelet and putting on a strap or simply changing the bezel color. The new interchangable design allows the wearer to change the combination of colors and materials to fit any occasion or just express herself. They will be available in stores at the end of June! The 11 strong Ben Bridge buying team checks out all the latest products at the JCK Show in Las Vegas and has a little bit of fun! Highlights include lots of beautiful Italian gold jewelry and giant Victorinox Swiss Army watches (read: Wall Clocks) as well as stopping by the “Kardashian Suite” in the Venetian to visit our friends at Gucci. We got to spend some time with supermodel Amber Valletta and Lisa ogled a tiny little bauble (35 carat D Flawless Emerald Cut). The Ben Bridge buying team explores the latest offerings at the Couture Show in Las Vegas, June 3, 2010. You are currently browsing the Ben Bridge Jeweler's Blog blog archives for June, 2010.